I would like to discuss the reasons why I chose the artisan art of Kintsugi as my life-long career. In Hikone city, Shiga Pref where my ancestors come from, there is Hikone Castle of I’i Naomasa and his descendents dating from the Sengoku Period (1495 to 1573). The castle houses an armor decorated with Shu-Urushi lacquer (clear lacquer mixed with Cinnabar Red)and called “I’I no Akazonae”, which the generations of lords of I’i clan wore over the years. The armor consists of the iron base applied with Shu-Urushi or clear lacquer mixed with cinnabar red color, using the art of Kintai Shitsugei. Kintai Shitsugei is an Urushi Art and consists of applying heat-hardening lacquer at high temperature over the forged base metal such as iron to prevent rusting of the iron base and increasing the mechanical strength, heating thus coated lacquer, hardening, and drying it to prevent the lacquer surface from peeling. Then, black or cinnabar red urushi is painted on the surface, and the work is finished by polishing. When I was a child, my father took me to the castle to see this red-lacquered armor for the first time, and I was utterly enchanted by its beautiful red color and elegant qualia. The image of red lacquered armor was imprinted in my mind most vividly. As the saying goes, “The child is father of the man, I studied the metal work at Tokyo University of the Arts guided by the memory of that momentous emotions. I then learned the arts of Urushi-art and Makie, and studied the techniques of Kintai Shitsugei or metal-based lacquer work in the Graduate School of Tokyo University of the Arts. I developed the unique technique of Kintai Shitsugei when I was 26. I have used the Kintai Shitsugei techniques for the past 40 years in creating Urushi Art and Urushi Art Jewelry. Having mastered Japan’s traditional art of Makie, I was motivated to start Kitsugi when I entered the Enshu Soke School of Tea Ceremony, took the pseudonym of Koutokuan Tsukamoto Soushi, and studied the Tea Ceremony of “kirei sabi or beautiful and quiet simplicity”, first established by Kobori Enshu, the tea ceremony master of the early Edo Period (1603 – 1704). My fatalistic encounter with “Kintsugi” occurred through the tea ceremony. This was when I first saw Kintsugi-decorated Akaraku Chawan “Sepppo or snow-covered mountain peak” created by Hon’ami Kouetsu, the great artist of the early Edo Period (housed in the Hatakeyama Memorial Museum), and realized the true magnificence of Kintsugi. 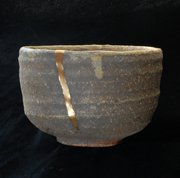 Hon’ami Kouetsu’s Akaraku Chawan “Seppo” was originally a failure because of the cracks caused in the kiln. The tea ceremony master, Kouetsu, repaired the crack with Kin’makie and imaged a snow covered mountain peak on which the morning sun poured. “Seppo” is a memorable work in that it raised the mere repair technique of Kintsugi to the realm of fine art. Since my encounter with “Seppo”, Akaraku Chawan, decorated with Kintsugi, I revered Hon’ami Kouetsu as the founder of Kintsugi Souke and worked for the past 40-odd years at perfecting my skills of Kintsugi regarding “Seppo” as a model. I am determined to work harder daily in order to raise my own art of Kintsugi to the realm of fine art, and spread it to the world. I believe this is my mission. 1968 Graduated from Tokyo National University of Fine Arts and Music, winning the "Salon de Printemps Award" for best graduate work. While specializing in engravings for his Master, he studied "Kintaishitsugei", the technique to apply Urushi on the surface of Precious Metals, commenced the creation of Urushi Art and Urushi Art Jewerly. 1972　Established a design company, Zivaco Inc., specializing in exterior and interior design. Alongside of his business, he continued producing Urushi Art. Became a pupil of a Enshuu-ryuu tea master, Kobori Soukei. Started his studies on "Kintsugi", the traditional technique to fix antique pottery with Urushi and gold. 1980 Zivaco Inc. opens Showji Tukamoto's Urushi Art Jewelry department. Starts to exhibit Urushi Art Jewelry annually at Galleries in Tokyo. 1986 Received a "Enshuu-ryu"tea master licence. 1989　Received International Scence Prize "Science pour L'Art" Award for exceptional art work. by the Moët Hennessy. Louis Vuitton. Awarded by Japan Design Competition. 1997 Exhibit Urushi Art at Lesley Craze Gallery's exhibition, "Japanese Contemporary" in London, England. Completion of his Urushi Art Object, "Movement of Wave" for the first floor lobby of Ikebukuro Sunshine 60 building in Tokyo, Japan. 2000 Established a school of "Kintsugi", the traditional technique of fixing antique pottery with Urushi and gold.